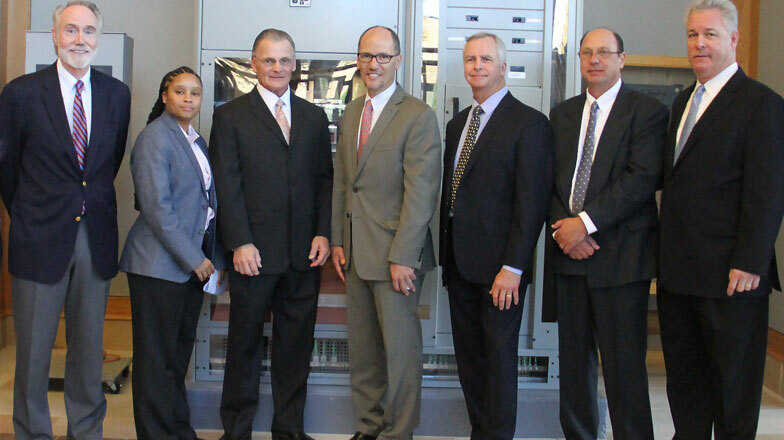 On November 3rd, a group of dignitaries joined U.S. Secretary of Labor Thomas Perez when he visited the JATC’s Lanham, MD training center. They included, from left David McKay, chairman of the JATC Trust Fund (JATTF), and president/CEO of Mona Electric Group; Kevin Burton, Assistant Director of JATC; Charles E. "Chuck" Graham, Business Manager, IBEW Local 26; Secretary Perez; Andrew A. Porter; Executive Director, Washington, D.C. Chapter, NECA; Rhett Roe, Director of JATC; and Steve Kelly Sr., President, Kelly Electric. The Washington, D.C. Joint Apprenticeship Training Committee (JATC) electrical apprenticeship programs are accredited programs that train approximately 150 new journeyman electricians to enter the local construction industry each year. It is jointly funded by the International Brotherhood of Electrical Workers, Local 26 and the Washington, D.C. Chapter of the National Electrical Contractors Association. “Our JATC programs invest over $8 million annually training the next generation of electricians at our Manassas, VA and Lanham, MD facilities. We are proud to make this investment in our industry and our people,” noted David McKay, chairman of the Joint Apprenticeship Training Trust Fund (JATTF). Both JATC facilities were recognized in recent ceremonies celebrating 2015 National Apprenticeship Week. On October 31, Virginia Governor Terry McAuliffe visited the Manassas campus, where he toured the training facility and signed a proclamation recognizing the outstanding contributions of the JATC’s programs to workforce development in the state. 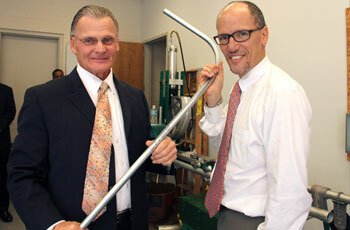 On November 3, U.S. Secretary of Labor Thomas Perez visited the JATC’s Lanham, MD training center where he was greeted by apprentices and faculty members and given an extensive tour of the facility. 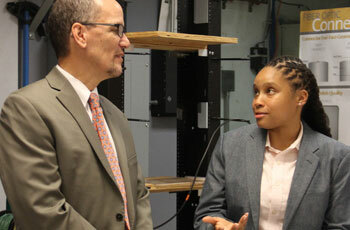 The secretary engaged a number of students in conversation about their experiences and expectations with the JATC program and was clearly impressed with both the quality of the apprentices and the training they are receiving. Learn more about the JATC apprenticeship program at www.getchargedup.org.